READY TO BUILD!! 19 LOTS AVAILABLE FOR SALE. Power, Water, Sewer and Cable already Connected. Rare Opportunity: 19 individual PUD Lots in an extraordinary neighborhood called Lakeview Ridge Community adjacent to Spring Valley Lake area. LOCATED IN THE HEART OF VICTORVILLE. Lot size range between 5,000 sf. +GG 8,590 sf. ** 2 of 19 Lots already have foundation in placed. Approx. 10 of 19 Lots with views overlooking the lake community in the distance. Most of Lots with mountain view. Comprised of 19 Lots for PUD Development. 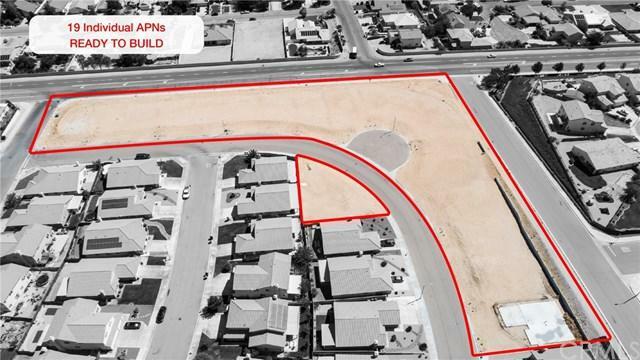 These 19 parcels are located in a well developed Lakeview Ridge Community neighborhood. HOA offers: Community Park, Pool and Tennis Court. Walking distance to Spring Valley Lake. **** Sale includes the following 19 APNs: 3090-561-24-0000, 3090-561-25-0000, 3090-561-26-0000, 3090-561-27-0000, 3090-561-28-0000, 3090-561-64-0000, 3090-561-79-0000, 3090-561-80-0000, 3090-561-81-0000, 3090-561-92-0000, 3090-561-83-0000, 3090-561-84-0000, 3090-561-85-0000, 3090-561-86-0000, 3090-561-87-0000, 3090-561-88-0000, 3090-561-89-0000, 3090-561-90-0000, 3090-561-93-0000.